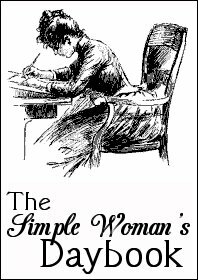 I'm trying something new today--I'm participating in the "Simple Woman's Daybook." I've always wanted to try it but never got around to it...so at long last, here's my official first entry! ...for the wonderful MOPS tea I attended this morning, and for the ability to catch up with a really good friend of mine I hadn't seen in awhile. Oh, and also for almost being done with painting my house! I just cleaned a big ol' pile of dishes I ignored last night which must've mated while I was at MOPS this morning! I also made some yummalicious (making up my own words again. I do that often.) Salsa con Queso I'm bringing to a friend's house for a little Cinco de Mayo mom's night out. Ole! My standard "uniform" of t-shirt and jeans with sneakers, with a cardigan because it's rainy and gross (as noted above). ...stir-crazy over listing my house! But also going to my aforementioned Cinco de Mayo night! Woohoo! And tomorrow is my sweet little twin niece and nephew's second birthday party, so that'll be nice. ...if the new pillow I bought is the source of my ridiculously stiff neck the past few days. It seemed like a good idea since my old pillow was too flat, but it might be getting get the heave-ho if this stiff neck doesn't clear up soon. Any pillow advice? I can never seem to find the right pillow out there! Oh, piles and piles of books which I mostly read before I drop off to sleep at night. A couple of the bee books I've been reading are: Honeybee: Lessons from an Accidental Beekeeper and Fruitless Fall. In other reading, I'm still working my way through this stack of books. It takes me forever to finish a book because I read so many at once! To make matters worse instead of just finishing some of the books before starting others, I've since added even more! to sell our house! And to see the sun again sometime soon! Lots of day trips I'm planning with the kids this Spring and summer. Also looking forward to our annual trip to the Outer Banks! Lots and lots about bees. And about how much work it is to actually try and keep on top of house work when you have three little kids in the house at all times (apparently not too successfully based on my mating dishes this morning!) in order to make the house "show ready." Turns out, I'm not a fan of "show ready." I'd gladly stick to my piles if given the choice! ...well, I pretty much just answered this one! But I'll add that I also have five, yes FIVE loads of clean laundry that need to be folded and put away...yet I sit here and type instead! (Note to self: reeeeeally need to improve in the whole "keeping up on housework" arena!) But hey, at least they're CLEAN, right?? How it is possible that we have FIVE loads of clean laundry that need to be folded and put away right now and how we're listing our house in a week or two. Do people just pile their cars full of stuff when they show their houses?? I mean, seriously, how do people do this and stay sane?? "I can do all things in Him who strengthens me." --Phil.4:13 Definitely need to keep telling myself this over and over! 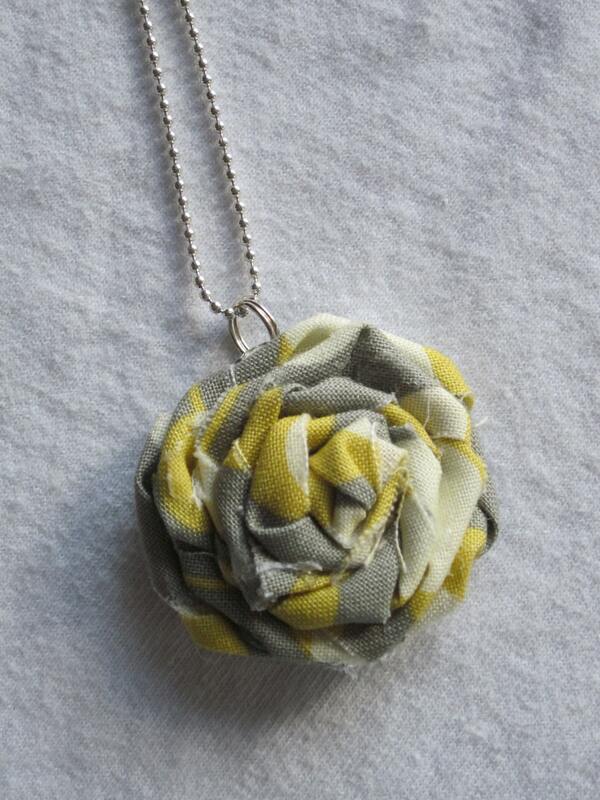 My yellow and grey flower necklace my sister made for me. Love it! Just my mexi night and the birthday party as well as my ongoing "hot date" with a paintbrush! Well, I do have a few mountains of my own laundry to look at - lol. Why does it seem that mountain just keeps reappearing? Have a great week and hope your house sells soon as I know how hard it is keeping it "show" ready with small children around. LOL I'm glad I'm not the only one w/ laundry mountains! :) Thank you for the selling well wishes! memory foam pillow...my neck always hurts when don't use it. I got mine from Amazon. Best Christmas present ever. Hubby always tries to steal it!